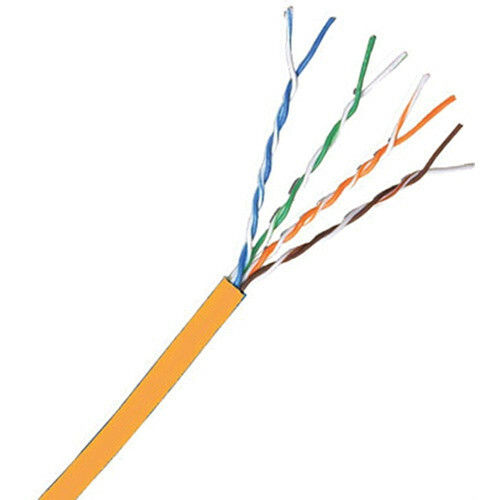 The Comprehensive Cat 5e 350 MHz Solid Cable - 1000' (Orange) is a local area network cable that has 4 unshielded twisted pairs and is made of solid 24 AWG construction. This bulk cable is ideal for your network installation. It is the right solution for wiring your home, office or the entire campus. The cable is has a PVC rated jacket and can be installed just about anywhere. The cable features a UL/NEC rating of CMR/MPR. It has a nominal outside diameter of 0.2" (5.08mm). The cable meets all the requirements as set forth in the Telecommunications Industry Association's standard 568 and 570 recommendations. Box Dimensions (LxWxH) 15.0 x 15.0 x 10.0"